I can’t be the only one who has a love/hate relationship with bookshops. This may seem like a sacrilegious statement from an English teacher, but hear me out. Yesterday, I found myself inside one of the cozier independent bookstores in my area, browsing with a few friends before a movie. As I drifted away from my friends and down the aisles, leafing through some new paperback fiction, moving on through the hardcover art books into the children’s section, I thought about how I could never trade buying real books in favor of an e-reader. No, I thought, I love books too much – their lightly textured covers, the weight of them in my hands, the ability to gently press down on each page as I wade further into the text. Even more than the physical qualities of books, I love the ideas inside. In truth, my most basic reason for choosing to teach English is because I am in love with the way that literature reveals to us so much about our common humanity. Oh yes, I do love books, and therefore, I love stores that sell books. Inevitably, though, I am wrenched from my book-loving haze by a nagging anxiety that I will never, ever have time to read all of the books that I want to read. Maybe this seems silly, but I become overwhelmed thinking about all of the beautiful words and exquisite stories that I will never consume. There will simply never be enough time for them all. Therein lies my “hate” relationship with these shops. They illuminate, in such clear and jarring fashion, the limited time we all have to lose ourselves in the beauty of words, stories, and ideas. 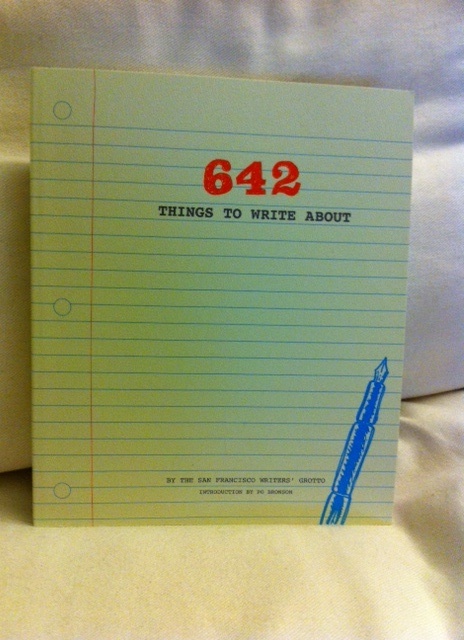 Ultimately, I settled on purchasing just one item, 642 Things to Write About, a collection of writing prompts compiled by the San Francisco Writers’ Grotto. Though I justified it as a practical purchase for my classroom, I really bought the book for me, as inspiration for my own development as a writer. For me, the anxiety is that I’ll never be motivated enough to read all the books I should be reading, instead of Harry Potter or the latest issue of People. But as a result, I share your love/hate relationship with bookstores. So true. I always end up buying something I know. Should read but probably won’t. Such a good topic! And timely. I’m now experiencing the same thing with e-book stores and my e-book “shelf”. Do you read any books on electronic devices, or are you strictly a paper gal? I’ll probably be posting some stuff I write in response to the prompts in this book on the blog, so look out for that. Thanks for being such a great reader of my blog! You da bestest! I wholeheartedly agree with your love/hate relationship with bookstores. It is quite anxiety-inducing walking into a bookstore for those reasons. I too am an avid lover of all that defines a book. I smell new books. My partner used to laugh at me when we used to walk through Borders and I would straighten out the books on the tables that were slightly askew. I almost allowed the seduction of e-book readers to sweep me along as I held the Kindle of a friend’s, but I quickly recovered! I too am an English teacher, trying to return to my dream of writing, which I know is my purpose.